Members of the phyllosphere fungal community possess a vast amount of unexplored antimicrobial substances. To detect and to quantify new antagonistic abilities, 241 fungal isolates were tested via confrontation tests. The 82 fungal species were isolated from the phyllosphere of different plants collected in Germany. Testing showed that 73 isolates belonging to 43 species had antagonistic effects against one or more of our test organisms: Bacillus subtilis (Bacteria, 39 active species), Cryptococcus terreus (Basidiomycota, 30 active species), Candida tenuis (Ascomycota, 17 active species) and Mucor plumbeus (Mucoromycotina, 3 active species). In most cases B. subtilis was suppressed, followed by C. terreus, Ca. tenuis, and M. plumbeus. Considerable antagonistic activity was shown by Chaetosphaeronema hispidulum, Hypholoma capnoides and Penicillium biourgeianum. These fungi exhibited antagonistic effects against all four test organisms. Alternaria alternata, Anthostomella pinea, Cladosporium cladosporioides, Drechslera catenaria, Drechslera poae, Fusarium acuminatum, Fusarium avenaceum, Fusarium tricinctum, Holtermanniella takashimae, Penicillium brasilianum, Penicillium brevicompactum, Pseudoseptoria obscura and an unidentified Sordariomycete also showed substantial activity, but not against M. plumbeus. 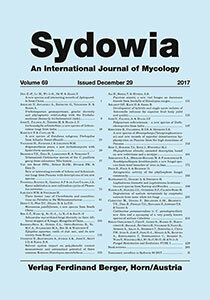 Almost no activity was found in Pucciniomycotina, Ustilaginomycotina, Bulleribasidiaceae (Basidiomycota) and Glomerellales, Helotiales (Ascomycota). After two years of subculturing, changes in the antagonistic abilities could be shown for 45 of the 91 isolates where 7 species showed increasing activity. Keywords: antagonism, endophytes, epiphytes, phyllosphere fungi.